This is one of the nicest dip recipes you can try. It may sound odd but is absolutely delicious. Heat oven to 350°. Combine cream cheese, Swiss cheese, mayonnaise, 1/3 cup of the almonds and all of the green onion. Mix well. Spoon mixture into a 2 cup size oven proof bowl or casserole. Bake for 15 minutes, stirring half way through cooking time. Garnish with the remaining toasted almonds. Delicious served warm with crackers and raw vegetables. Use light cream cheese and mayonnaise to turn this into a terrific low fat dip. Try switching it up by using cheddar cheese and pecans, or whatever combinations of cheese and nuts you think will work well. A little change from the ordinary cream cheese spread recipe, this spread has Swiss cheese, savory green onions and the crunch of healthy almonds. It’s best served while still warm from the oven so time it to be ready just before it’s to be served. Served warm with vegetables and crackers it is one of those appetizer party recipes your guests will love. 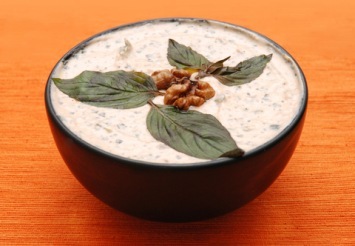 For more great dip recipes and to browse all of Cooking Nook’s free online recipes, click here.